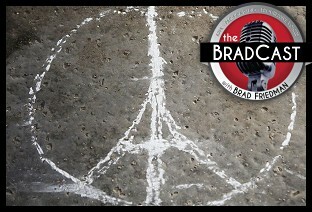 " Articles in Category: Lebanon	"
On today's BradCast (audio link below), I'm joined by anti-war author and activist David Swanson of WarIsACrime.org and RootsAction.org. We discuss, among other things, the extraordinary response to his article, "Non-French War Deaths Matter", posted just hours after the terror attacks in Paris. The piece, which I read in full at the top of yesterday's show, notes how similar civilian massacres in non-European nations --- many just days before Paris --- are equally troubling, if not more so, yet were almost entirely ignored by much of the media and the world. He tells me his article began with a Tweet. "Usually, my tweets get 3 or 4 retweets. This one is over 12,000 at this point." Swanson says the interest in the issue was "driven largely by the media-fueled sympathy for the horror and suffering in France, which is entirely appropriate and desirable and needs to be built on. But also, there was this disgust with the politically-driven, selective nature of where the mass media tells us to direct our sympathies." He believes that the interest in the topic is evidence of those who "share my desire to have that sympathy broadened to all victims of organized violence, not just those in a politically friendly government and a white Christian European population." As to how the media, and our politicians, ultimately end up delivering exactly what terrorists want in these situations, Swanson argues: "What they want is fame. What they want is to be targeted as the prime enemy of the foreign imperialists. What they want is the bombing, and this is what the US government is giving them and France is giving them and the media." He goes on to list a number of threats that are far more likely to kill Americans (including both McDonald's and Climate Change), but which are rarely, if ever, given the same wall-to-wall media and political spotlight now being enjoyed by the Paris attackers. Nations like the U.S. and France, he tells me, "need to stop repeating this mistake of creating blowback and then using that as justification to escalate the violence that created the blowback in the first place." But if the way to respond to the attacks by ISIS in Paris and elsewhere is not more war, what are the solutions for the mess the world now finds itself in? For Swanson's answers to that question, you'll need to tune in to today's program.